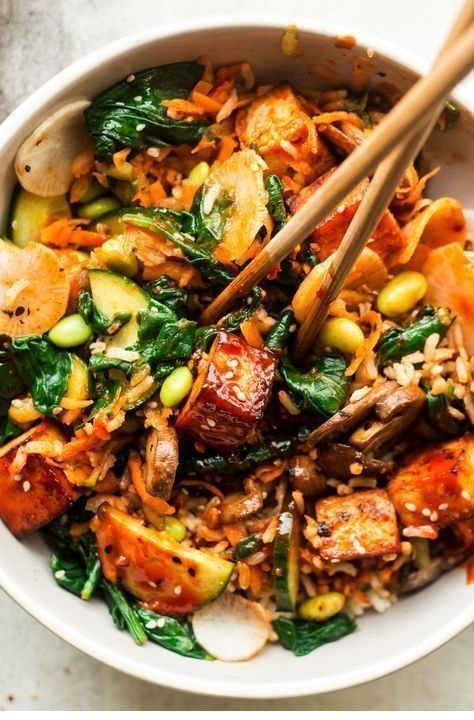 Vegan bibimbap is a plant-based take on a classic Korean mixed rice dish. It's full of flavours and textures, naturally gluten-free, deliciously addictive and healthy! Cut a pressed block of tofu into equal size cubes – I got 12 out of mine. Place the tofu in a shallow bowl and pour soy sauce (mixed in with 1 tsp of Gochujang) over it. Set the tofu aside for at least 30 minutes to allow the tofu to absorb the marinade, making sure you turn the pieces to the other side at least once, halfway through. If you have a non-stick pan, you can pan-fry the tofu. Heat up 2 tsp of oil on a non-stick pan. Place the marinated tofu cubes into the hot oil. Fry, turning frequently until browned on all sides. Be careful as the tofu is likely to splatter a little bit initially.